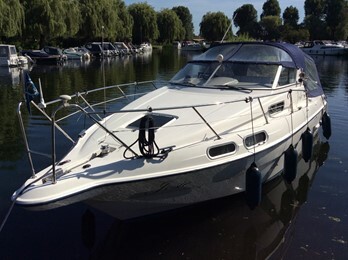 This very tidy Sealine 290 Ambassador 290 was re engined with twin Ford diesels in 2005. The craft has been constantly updated by her current owners. The platform and transom door allow easy access. As usual Sealine present a spacious and clever design that offers plenty of cabin space within an open plan interior, but with an aft cabin extending under the rear cabin which is remarkably roomy. The boat has a large social cockpit with ample seating and a transom door.